I wanted to share a few summer finds from Topshop with you. I find Topshop one of those shops that you really have to sift through quite a lot to find the gems. Much of their range feels a little too youthful for me, but there are always a few pieces that seem to work. This is a really soft cotton dress, perfect for hot weather. It was 32 degrees in London today and I felt so comfortable in this all day, I hate wearing anything too clingy in the heat. I am wearing a size 6, I would say it comes up big, so definitely take your usual size, and the size down if you are usually between two. This is a really lovely little dress. I love the frill detail on the hem and the sleeves and on me it’s a great length if you don’t like your knees to be on display. ( I am 5’4) I pulled out the pinky tones in the dress with my shoes and my bag, but you could dress it down with tan sandals. Just a really easy and classic summer dress. 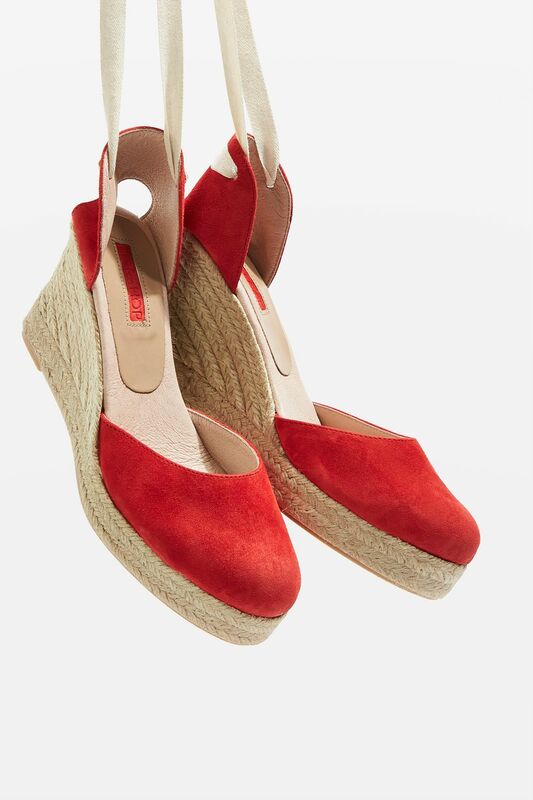 I also spotted these gorgeous red espadrilles which seem to be selling out quickly. That’s all for today, I hope you are having a fabulous saturday in the sunshine. would you kindly share what size you took in the red tea dress?